South Korea on Friday grappled with the massive blaze that roared through forests and cities along the eastern coast, declaring a national emergency and mobilizing all available resources to bring the inferno under control. Over 13,000 rescue officials from across the nation battled to contain the fire that started in a mountainous county of Goseong, about 160 kilometers northeast of Seoul, before spreading to neighboring Sokcho, Gangneung and Donghae cities within hours. One man died in the fire and 35 others were injured, with at least a few thousands left displaced and damage piling up to what authorities have described as "an unprecedented extent." The government declared a state of national disaster for the affected areas as of 9 a.m., enabling swift provisions of relief supplies and other resources necessary to minimize the damage. President Moon Jae-in urged his government to make all-out efforts to contain the fire and help the victims. He told officials to consider designating the blaze-hit areas as special disaster zones. That would entitle the locations and their residents to speedy, special government support. "I ask you to do your utmost until the very last moment when all embers are completely put out," the president said earlier in a crisis management meeting held at the national crisis management center at his office Cheong Wa Dae in Seoul. Given that the fire-hit regions are located near the inter-Korean border, the government said it will share information with the North about the blaze and rescue status, and will seek bilateral cooperation if necessary. The military and police sent their forces to the scenes to help contain the fire. The 8th Army Corps deployed 3,500 of its men and flew 10 military choppers to the sites. Over 1,600 police forces from 13 squads and guard units from Gangwon, Gyeonggi and central North Chungcheong provinces joined the forces to put out the fire. The Ministry of National Defense set up a disaster control support team to help contain the fire, providing military choppers and fire engines, and 16,500 troops. As of 11:00 a.m., the blaze had burned 525 hectares, or 5.25 million square meters of woodland, and destroyed more than 200 houses and buildings, according to the Gangwon control center. 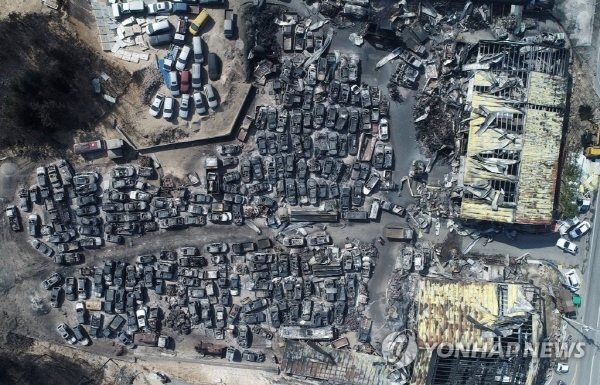 The interior ministry said most of the fire in Goseong had been contained and more than 50 percent of the blaze in Inje and Gangneung was under control as of around noon. The government's possible decision on special disaster zones will be up to the results of an assessment of damage scale. The regions affected include the counties of Goseong, Inje and Sokcho, as well as Gangneung and Donghae cities. With the designation, they would be eligible for emergency funds and other assistance at the direction of the central government. South Korea declared states of disaster in 2005 in the wake of a massive wildfire in Yangyang in the same province and in 2007 after South Korea's worst oil spill from a Hong Kong-registered tanker off the western coast of Taean. The fire, believed to have started on a roadside in the county in Gangwon Province, spread quickly to neighboring areas, engulfing Sokcho, Gangneung and Donghae farther south within hours, as strong southerly winds blowing at speeds of up to 35.6 meters per second fanned the flames. Over 870 firetrucks and some 13,000 firefighters have been dispatched to the sites to put out the blaze, firefighters said. More than 4,200 people have been forced from their homes. Among the damaged buildings are nursing facilities and commercial camping sites -- the eastern coastal cities are popular resort and travel destinations. Roads and railways have been shut off, with 52 schools and other public facilities closed. The authorities are processing the scene to figure out the exact cause of the blaze. They first suspected an explosion of equipment installed on a telephone post, as witnesses said they heard a blast. 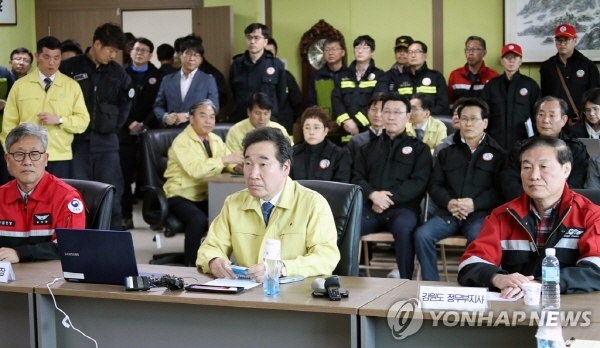 After conducting a preliminary examination, the Korea Electric Power Corp. said the switch on the pole is unlikely to have exploded on its own, adding that it could have been a spark created from wires and dust in the very dry air.